STANFORD – Donald Trump’s surprise election as the 45th president of the United States has spawned a cottage industry of election post-mortems and predictions, in America and abroad. Some correlate Trump’s victory with a broader trend toward populism in the West, and, in particular, in Europe, exemplified in the United Kingdom’s vote in June to leave the European Union. Others focus on Trump’s appeal as an outsider, capable of disrupting the political system in a way that his opponent, former Secretary of State Hillary Clinton – a consummate insider – never could. There may be something to these explanations, particularly the latter. But there is more to the story. In the months preceding the election, the mainstream media, pundits, and pollsters kept repeating that Trump had an extremely narrow path to victory. What they failed to recognize was the extent of economic anxiety felt by working-class families in key states, owing to the dislocations caused by technology and globalization. But, as I highlighted two months before the election, those frustrations were far-reaching, as was the sense of being ignored and left behind – and it was Trump who finally made that group feel seen. That is why I recognized the possibility of a Trump upset, despite Clinton’s significant lead in the polls (five points, just before the election). And an upset is what happened. Trump narrowly won states that Republicans had not won in decades (Wisconsin, Michigan, and Pennsylvania), and won big in usually closely contested Ohio. In fact, Republicans secured a broad victory. The party retained control of the Senate, even though more than twice as many Republican seats were up for reelection than Democratic seats, and it lost just a handful of House seats, far fewer than the 20 predicted. Moreover, the Republicans now control 33 governorships, compared to 16 for the Democrats, and have expanded their already-large majorities in state legislatures. Now, talk has turned from the impending implosion of the Republican Party to the repudiation, disarray, and bleak future prospects of the Democrats. Since the election, Trump has moved quickly to assert himself. Republicans, even those who opposed Trump during the campaign, have coalesced behind him. Meanwhile, the Democrats in government – most notably President Barack Obama – have largely echoed Clinton’s gracious concession-speech injunction that Trump should be given an opportunity to lead. The US election’s unexpected outcome holds four key lessons, applicable to all advanced democracies. First, growth beats redistribution. Clinton’s barely discussed economic plan was to expand Obama’s left-leaning agenda, so that it looked more like the socialism of her opponent in the Democratic primary, Vermont Senator Bernie Sanders. Higher taxes for the wealthy, together with more “free” (taxpayer-paid) services, was, she argued, the best route to combating inequality. Trump, by contrast, hammered home messages about jobs and incomes. Though the media almost exclusively covered his most hyperbolic and controversial statements, it was largely his economic message that won him support. People want hope for a better future – and that comes from rising incomes, not from an extra government-issued slice of the pie. The second lesson concerns the risk of dismissing, let alone condescending to, voters. From the start, Clinton was not broadly liked. Revelations during the campaign – for example, that, in a 2015 speech, she had said that “deep-seated cultural codes, religious beliefs, and structural biases have to be changed” to secure women’s reproductive and other rights – reinforced fears that she would push too progressive a social agenda. Recognizing these shortcomings, Clinton tried to win the election by making Trump unacceptable. But her remarks that half of Trump’s supporters belonged to a “basket of deplorables” – that they were racist, sexist, homophobic, xenophobic, Islamophobic – reinforced the impression that she and her party looked down on Trump voters as morally contemptible and even stupid. Such statements could well have pushed some undecided voters to decide against Clinton. The third lesson is that a society’s capacity to absorb rapid change is limited. When technological progress and globalization, not to mention social and cultural change, outpace people’s ability to adapt, they become too jarring, disruptive, and overwhelming. Many voters – not just in America – also fret over terrorism and immigration, especially in combination with these rapid changes. Add to that concerns about America’s growing opioid epidemic and a tedious and intolerant form of political correctness, and, for many, change did not look like progress. If democratic political systems do not find ways to ease transitions, provide shock absorbers, and accept heterodox attitudes and values without condemnation, voters will push back. The final lesson relates to the danger of the ideological echo chamber. The repeated claim by shocked Clinton voters that no one they knew voted for Trump reveals the extent to which too many people – Republicans as well as Democrats – live in social, economic, informational, cultural, and communication bubbles. These developments undermine people’s capacity to engage in informed, rational discussions, let alone debates, with those who have different perspectives, values, or economic interests. Even universities, which are supposed to foster knowledge-sharing and spirited debate, are now suppressing it, for example by spinelessly rescinding speaking invitations to almost anyone that some group or another considers objectionable. When we fail to engage in such debates – when people choose “safe spaces” over tough discussions – we lose our best chance of building consensus on how to solve at least some of our societies’ pressing problems. - Recent court documents reveal manipulation of the silver markets by a number of traders at major banks. - None of this should surprise precious metals investors. - Precious metals investors should make sure they maintain an investing style that avoids susceptibility to these tactics. Recent court documents, that represent part of a cache of chat-room transcripts, for the first time provide an inside look at how traders allegedly fixed silver prices as reported by Bloomberg. These documents were provided to silver investors as part of a $38 million settlement in April between them and Deutsche Bank over allegations of market manipulation. In the documents filed last week in Manhattan federal court, the investors told a judge that the transcripts offer convincing evidence to warrant new claims against other Banks. "Cant wait for another day when we get the bulldozer out of the garage on gold and sil," the Fortis trader wrote on Feb. 25, 2008. "Haha yeah," responded the Deutsche Bank trader, in a chat-room transcript included in court papers. Many of the chats involve a UBS trader known as "The Hammer," who on April 1, 2011, wrote a message urging coordination in trading, according to the records. "We gotta do it the same next time...if we are correct and do it together, we screw other people harder." A few months later, on June 8, "The Hammer" suggested to a Deutsche Bank trader that they recruit new members to join the alleged conspiracy, the records show. "We need to grow our mafia a lil get a third position involved," the UBS trader wrote. The Deutsche Bank trader responded, "Ok calling barx," a reference to Barclays, according to the documents. We will leave the legal system to work out the consequences for the traders and the banks (or not as is more probable), as we wanted to focus on how these latest revelations affect the individual investor. Regardless of what is right and wrong and how things should be, this is the investment world we live in, so investors need to do the best that they can in how markets work today. So here are our takeaways from this latest scandal. There is nothing new under the sun, and these latest accusations of manipulation is certainly nothing new. In fact, master trader Richard Wyckoff, was incorporating these "big boy manipulative strategies" in his own trading back in the 1920s and 1930s. This strategy, which is discussed a bit by the Financial Post, essentially says that the best way to succeed in the markets is to watch the "big operators" and understand what they do and how they make money. Wyckoff discusses how these big operators will bid down a stock or commodity through different types of strategies, while accumulating. Then once others join in on the slaughter, these big operators will be buying that asset off of the hands of these new entrants. Finally, when they have attained their full position, they will use the same strategy in reverse and bid up the asset and clear out those who jumped on the short selling bandwagon and make a lot of money doing it. Does that not sound a lot like what these traders were doing? It sure does to us. The key here is to be able to PUSH others into buying or selling their positions. That is where emotions come in. These manipulators were not creating fake news events or issuing bogus reports on why silver (NYSEARCA:SLV) needed to be bought/shorted. They were simply making massive joint-trades in the silver market to cause other investors to panic and buy (or sell) their own positions - preferably done during illiquid hours to get the most for their money. That means the first takeaway from this story is that investors need to control their emotions. Do not get too excited when things drop… and when things rise. After all these traders manipulated silver upwards as well - after all you can make money on both directions. If you are going to be a short-term investor in the gold and silver market you need to be able to invest unemotionally. These are certainly not the only traders in the market colluding to drive prices - remember it has been going on since the dawn of trading. When you read the transcripts of those chats, one thing that should stand out for investors is the fact that the goal of much of this price action was to either front-run client order OR trigger stop-loss orders. Front-running clients can make some decent cash, but far and away the more profitable action is to be able to trigger cascading stop-loss orders - where hitting one stop-loss triggers others. The money is made buying back after the initial "muscle". The clear lesson here is to not use stop-loss orders in positions. While stop-loss orders are quite useful to protect profits, based on these transcripts, it is clear that these are targets and when your trading strategy is a target for others to make money it is probably not worth doing. Stop-loss orders are often used with leveraged positions to avoid margin calls and big losses when these are triggered. But for those investors buying with leverage, know that you have a significant disadvantage when some of these bull/bear raids occur - and in precious metals they have been occurring quite frequently. The downside to any manipulative trade is that by definition since manipulation distorts fundamentals, it can never last forever. We have been emphasizing for quite some time now that fundamentals are extremely good for precious metals when using a horizon that spans more than a year as investment in exploration has been cut severely. One of our favorite charts from Goldcorp probably shows it best. This is not some "pie-in-the-sky" corporate chart trying to sell gold on behalf of the miner - we are actually seeing it happening already in their reserves. These numbers from a previous piece detailing miner reserves at the end of 2015, shows gold reserves (NYSEARCA:GLD) are not being replaced. 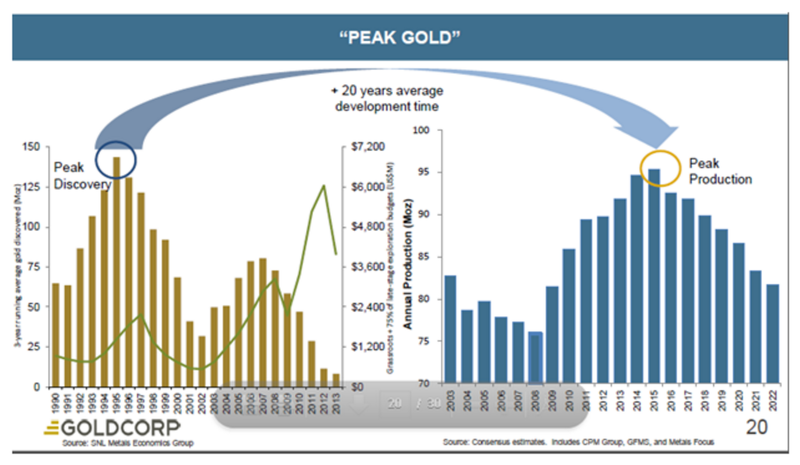 Exactly the point shown in the Goldcorp presentation. Thus, investors should always remember that fundamentals always trump manipulation … eventually. 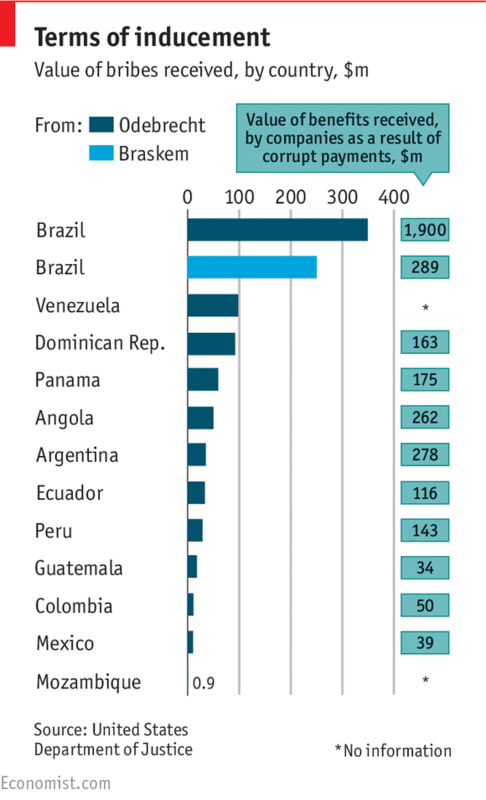 THE bribery affair centred on Petrobras, Brazil’s state-controlled oil company, has already shaken that country. The petrolão (“big oily”), as the scandal is known, has landed bosses of its largest construction conglomerates in jail and helped topple Brazil’s president. Now it is causing earthquakes abroad. On December 21st America’s Department of Justice (DoJ) reached a $3.5bn settlement with Odebrecht, Brazil’s biggest builder, and with Braskem, a petrochemical joint venture between that firm and Petrobras. The DoJ alleges that since 2001 Odebrecht and Braskem paid $788m in bribes to officials and political parties in Brazil and in 11 other countries. Most of these are in Latin America. They include Venezuela, Mexico, Argentina and the Dominican Republic (see chart). Two Portuguese-speaking African countries—Angola and Mozambique—are also on the list. The payoffs brought Odebrecht and Braskem contracts for around 100 projects, many of them to build public infrastructure. Often, governments paid more for the work than they needed to. The DoJ alleges that Odebrecht set up a “Division of Structured Operations”, which “effectively functioned as a stand-alone bribe department”. The American investigators say that the companies’ top brass, including Marcelo Odebrecht, the conglomerate’s former boss and grandson of its founder, not only knew all about the scheme but authorised it. He is now serving a 19-year jail sentence in Brazil for his role in the Petrobras scandal. 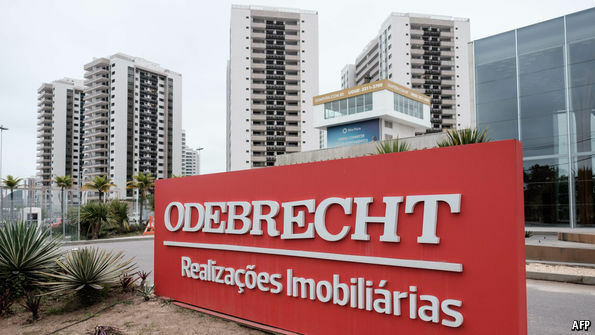 Odebrecht has accepted that the appropriate fine for the company is $4.5bn but says it can only afford $2.6bn; the remaining $900m is owed by Braskem. The FCPA, enacted in 1977, applies to any company that has issued securities in America (as Braskem has) and to firms that have used American banks (which both did). For a long time it was feebly enforced. That changed about a decade ago, as the Siemens case demonstrated. The DoJ’s investigation of Odebrecht and Braskem suggests that its co-operation with authorities in other countries has stepped up a gear. The DoJ’s account of the settlement does not name officials who took the bribes in the dozen Latin American and African countries. It will be up to prosecutors and judges in those countries to pursue the corrupt officials through the courts, a process that is more likely to happen in countries where the judiciary is independent. The authorities in the 11 newly named countries “must now act on this information”, said José Ugaz, the chairman of Transparency International, an anti-corruption NGO, in a statement. Even in Brazil the settlement is unlikely to be the end of the saga. As a company with securities traded in New York, Braskem can expect civil suits from aggrieved investors. Odebrecht is a shadow of its former self. To survive the investigations, it has been retrenching. Over the past three years the company has reportedly laid off 100,000 of its 181,000 employees, most of them since the launch of the Petrobras investigation in March 2014. Odebrecht is disposing of assets to refocus on construction, which accounts for a third of sales. In October it sold its water-and-sanitation business to a Canadian investment fund for 2.8bn reais. Even Odebrecht’s stake in Braskem, which makes up half of the construction firm’s revenues, may be up for sale. That is quite a comedown for a company named in 2010 by a Swiss business school as the world’s best family-run firm. IS’ capture of Palmyra has pulled the cloak back on Russia’s vulnerability. Islamic State forces launched a coordinated offensive in the area on Dec. 8, and by Dec. 11 the city had fallen. IS forces are now threatening Syria’s Tiyas air base, approximately 30 miles west of Palmyra, and fighting continues as of this writing, though Syrian forces seem to be holding their ground for now. That future is now, and it has serious implications for the major players involved: IS, Russia and Syria. For IS, Palmyra was a target of opportunity. The fighters aligned with Syrian President Bashar al-Assad who took Palmyra last March were not a uniform force, and their strength has diminished in recent months. Some Iranian militias involved in the March offensive against IS were pulled back to Iraq to support the ongoing Iraqi assault against Mosul. Syrian forces were taken from the front lines in Palmyra to support the Assad regime’s fight to secure Aleppo from Syrian rebels. Palmyra became a soft target for a quickly massed and well-executed IS attack. Despite the political and popular prognostications regarding IS’ imminent collapse, IS’ operations in the Palmyra area show that it remains a capable fighting forcé. 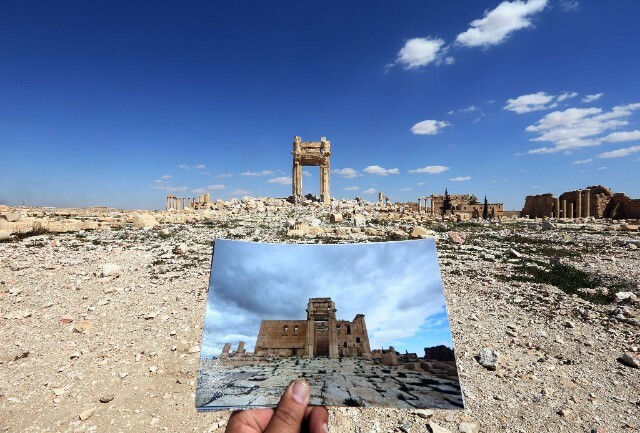 IS never capitulated on Palmyra even after retreating from the city last March. In May, for example, IS launched an operation to secure the al-Sha’er natural gas field north of Palmyra, shelling Tiyas air base in the process. That significantly damaged the base as well as Russian attack helicopters stationed there. IS is focused on Palmyra because it has a major strategic interest in holding this area. The key strategic point is not specifically Palmyra, but rather the M-20 Highway, a straight shot from Palmyra to the well-defended Deir el-Zour, IS’ second most important city. IS doesn’t necessarily need to hold Palmyra, and the city is not an easily defensible position, as changing hands three times in 18 months indicates. But Palmyra is where three highways meet to connect Homs, Damascus and Deir el-Zour. When IS retreated from Palmyra in the past, it maintained control over most of the section of the M-20 that leads to Deir el-Zour. From IS’ perspective, the more of this stretch of highway it can control, the more secure its position. Besides this basic strategic value, IS chose this move now for two other reasons. The first is that IS has lost many of its previous sources of arms and matériel. Turkey has clamped down on the border in northern Syria and is supporting Syrian rebel assaults on the IS-held city of al-Bab. In Iraq, IS territories are under significant strain. Videos released by al-Amaq, IS’ media arm, show IS fighters in Palmyra seizing large quantities of arms, ammunition and tanks left by the retreating forces. In this sense its attack on Palmyra reveals one of IS’ biggest weaknesses: the inability to produce its own armor or weapons. The second reason is that the Assad regime seems to have finally gained control of Aleppo, with state-run TV reporting that the city officially was “liberated” by Assad’s forces on Dec. 12. The Syrian army is a far cry from what it used to be, and significant rebel pockets still exist, especially in Idlib province. But the prospect of Assad consolidating his gains and eventually setting his sights on attacking IS means IS needs to divert Assad’s resources away from consolidation efforts to strengthen its own position relative to Syrian forces, should they begin to focus more on IS positions. IS’ position compared to that of Assad’s forces is actually better than it may seem. While Syrian rebels in Aleppo appear to be nearing defeat, the remaining areas under Syrian rebel control are directly between Assad’s main stronghold on the coast and resupply routes to Aleppo. As the above map shows, the supply line from Assad’s main forces to Aleppo is actually a narrow band extending through Hama to Ithriya, and up to Aleppo. These roads are vulnerable to potential IS attack, and IS has continued to attack villages and areas in and around Homs in recent months. IS needs the Syrian rebels to continue to be a thorn in Assad’s side to prevent Assad from coming after IS in full-strength. IS can help the rebels do that by threatening Syrian supply lines and forcing Assad to move his forces away from the main theater with the rebels. It is unlikely that IS is contemplating an assault on Homs, which currently isn’t in IS’ strategic interests. But if the defenses at Homs resemble those at Palmyra, IS won’t hesitate to take advantage. For both Russia and Syria, losing Palmyra, even if only temporarily, is deeply embarrassing. Details on the number of forces involved in this recent battle are still sketchy, but Russian and Syrian reports claim that a large IS force between 4,000 and 5,000 fighters and backed by tanks and armored vehicles approached the area from multiple directions. These IS forces, according to reports, were able to drive back the city’s defenses despite Russian airstrikes that purportedly killed more than 300 IS fighters. This is not an inconceivable number. IS has maintained a presence in this region even after retreating from Palmyra in March. It may have augmented those forces with fighters pulled out of Mosul before the Iraqi assault on the city began in October, and possibly with elements of the Caliphate Army, a brigade-size force of IS’ most elite fighters that Raqqa deploys wherever it is most needed. That said, Syria and Russia also have every reason to exaggerate the size of the IS force to hide their own deficiencies. It is also entirely feasible that IS’ size was much smaller, and they simply executed a well-crafted plan of attack. According to the Institute for the Study of War, after Russia and Iran pulled back their garrisons, only a few hundred poorly-trained militiamen from Syria’s National Defense Forces remained to defend Palmyra. It would not take an IS force of overwhelming size to make quick work of untrained and unmotivated Syrian forces. For Russia, IS’ retaking of Palmyra is a blow to its image. In war, image is usually less important than reality, but this isn’t really Russia’s war. One of Russia’s primary reasons for being in Syria is to gain prestige and to hide its own weaknesses with a limited show of force in Syria. Russia announced its intervention in Syria a few months after Palmyra originally was taken by IS. When Syrian and Iranian forces retook the city with Russian support, the Russians went out of their way to publicize their role in the success. They even deployed an orchestra to the city to play a classical music concert in the ancient ruins, featuring a selection from Bach’s “Partita No. 2” and Prokofiev’s “Symphony No. 1” in its entirety. A demonstration of Russian weakness is not what Russian President Vladimir Putin has in mind for his country’s involvement in Syria. Adding insult to injury, Russia all but declared mission accomplished last March when it announced it was withdrawing many of its forces from Syria. In reality, Russia has not been able to pull back. Even with continued Russian air support, Assad’s forces have taken well over a year to consolidate control over Aleppo, and that fight still is not over, despite the boasts of Syrian state-run TV. Now in Palmyra, much-touted Russian gains have been overturned, despite continued Russian airstrikes in the area. It shows how limited airpower can be in a conflict like this, and how limited Russia’s intervention in the Syrian conflict actually has been. Russian airstrikes were unable to protect Palmyra from IS fighters, who have no air assets to speak of, and IS fighters are now attacking an air base that normally houses two fixed-wing attack squadrons of Syrian air force Su-24 and Su-22 fighter jets. With each passing month, Russia risks being bogged down in an interminable conflict in the middle of the Syrian desert. For the Assad regime, the news of Palmyra tarnishes recent gains the regime has made in Aleppo, and shows the difficult position in which the Assad regime remains. Assad’s forces have fought a brutal war for almost five years, and those left are tired and bogged down in securing Aleppo, while many other rebel strongholds still need clearing. That Assad has had some recent success in Aleppo should not obscure that his forces, even with air support, are vulnerable to attacks like the fairly limited offensive in which IS is currently engaged. Assad simply does not currently have enough forces at his disposal to defeat all of his enemies. IS retaking Palmyra does not change the balance of power on the ground – it merely illuminates it. The Islamic State, despite myriad challenges, remains a highly capable and opportunistic military fighting force fortifying its most important strategic holdings in Raqqa and Deir el-Zour, in preparation of future battles. Russia’s intervention in Syria has been, and remains, limited in scope and effectiveness. The Assad regime is propping itself on air power and limited Russian support, but it lacks the force necessary to pacify the country, its recent successes in Aleppo notwithstanding. The war goes on. 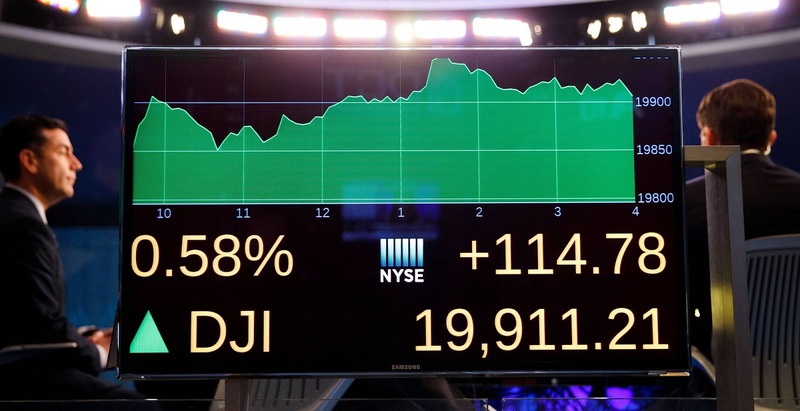 Big round numbers in the Dow Jones Industrial Average make people feel good, if only because they are an occasion to trot out the smooth and ever-rising 100-year stock market chart. Barring some major change to that long-run pattern, we may be toasting Dow One Million around the year 2094. Zoom in, though, and the line looks a lot bumpier. The first time the index crossed the 100-point mark back in 1906, it seemed like a good omen for a roaring bull market, but Wall Street experienced its first crash of the 20th century the following year. It would be nearly two decades later, in the middle of an even greater bull, that the index would leave the century mark behind for good. A similar pattern held for the 1000 level, first touched in 1966 on an intraday basis at the very tail end of the secular postwar bull market. It wasn’t until 1982 that it was crossed for the final time – we hope. As for 10000, anyone who assumes it’s one for the history books has a lousy memory. The Dow fell 53% between its high in 2007 and its low in 2009. The most recent crossing, early in the current bull market, came more than 11 years after the index first touched 10000. More than perhaps any other financial indicator in the world, the Dow is both a barometer of social mood and an influence on it. Even financially unsophisticated people know that triple-digit gains or losses, though they don’t pack the punch they once did, are meaningful. In a little over a month since the presidential election, not only stock prices but several measures of economic confidence have surged. Separating cause and effect is difficult. Last week, the preliminary University of Michigan Consumer Sentiment Index was a 10th of a percentage point shy of a 12-year peak. And a long-running survey by the American Association of Individual Investors has shown a strong swing from pessimism to optimism since the week before the election. The current four-week streak of above-average bullishness is the longest since 2014. Professionals are even more optimistic. Bank of America Merrill Lynch’s latest monthly survey of global fund managers showed the net share of respondents expecting a stronger economy in a year at a 19-month high. The percentage expecting above-trend growth was at a five-year high. That should give investors pause since sentiment is a classic contrarian indicator for markets’ medium-term direction. And, while none of these surveys dates back as far as the Dow, there is an excellent proxy for markets’ confidence that serves as a twofer: valuation. Yale professor Robert Shiller’s cyclically adjusted price-to-earnings ratio now stands above 28 based on a decade of inflation-adjusted earnings for the S&P 500 stock index, which tracks the Dow closely. That puts stocks within the most expensive 5% of all observations in 135 years. 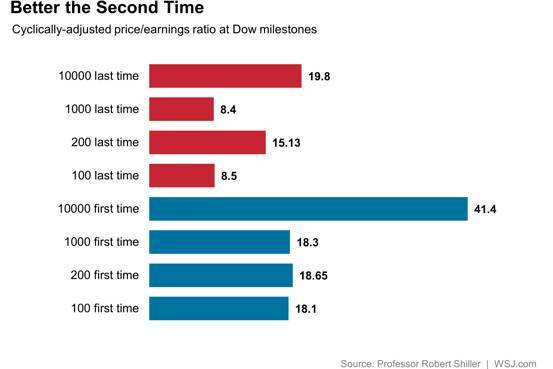 At some Dow milestones that took years to break through decisively – 100, 200, 1000 and 10000—valuation also has been elevated at an average of 24 compared with a little less than 13 when the market finally left those marks behind. Allowing for the possibility that the Shiller P/E is unduly inflated these days, as some claim, that still leaves open the possibility that the market has quite a way to go to grow into its Dow 20000 valuation. At the long-run rate of inflation-adjusted earnings growth, it would take about 14 years for the Shiller P/E to fall below 20 at current stock prices. That would be par for the course as it took an average of 15 years for Dow 100, 1000 and 10000 to be visited for the first and last times. Past isn’t prologue, but keep those Dow 20000 hats around – they may come back into fashion around the year 2030. In 2012 I wrote a book called "The Coming Bond Market Collapse", in that book I predicted that the bond market would begin to collapse by the end of 2016. Clearly, this prediction has started to come true. However, in all candor, I never dreamed that the Ten-year Treasury yield would plummet to 1.3%. Neither did I ever imagine that over thirteen trillion dollars' worth of global sovereign bonds would have a negative yield, as was the case this past summer. The Book's assumption was that the bursting of the bond bubble would be caused by a change in global central banks' monetary policy or through the eventual achievement of their inflation targets. At this juncture-at least in the U.S. -- we have both. The Ten-year Treasury note has risen 80% since July based on both the return of inflation and the Fed's desire to raise interest rates. This begs the question: how high could interest rates climb and what is the interest rate that will break the Trump rally's back? Back in 2007, before anyone knew what the phrase Quantitative Easing meant, nominal GDP was around 5%, our National Debt was $5.1 trillion (64% of GDP) and the Ten- year was 5% -- there is a strong correlation between nominal GDP and the 10-year note. Therefore, without any central bank-manipulation of long-term interest rates, it would be logical to conclude that the rate would rise back towards the 5% level as long as Mr. Trump can produce real growth of 3% and inflation around 2%. But, given today's $20 trillion of National Debt, which is north of 105% of GDP, and the condition of soaring annual deficits, it would be prudent for bond investors to require an even higher yield than 5%. The U.S. budget deficit has started to rise due to unfavorable demographics and an economy that is already suffering from a debt-disabled condition. The deficit for fiscal 2016, at $587 billion, was 34% higher than 2015. And the projected fiscal deficit for 2017 is $616 billion dollars, but that is before we factor in the new administration's tax cut and spending plans. The Committee for a Responsible Federal Budget (an independent organization) estimates that Trump's tax plan will add 4.5 trillion dollars to the deficit over the next ten years. That could add an additional $450 billion to the annual red ink. Adding to this we have borrowing costs on the rise. For every 25 basis point increase in rates, there is a $50 billion addition to the deficit. Given that the National Debt was financed at an average rate of 2.21% last year, the current increase in yields experienced already could add an additional $50 billion to the interest expense. In fact, the Congressional Budget Office sees the annual tab for interest on the debt doubling between now and 2020. Then we have Donald Trump's massive one trillion-dollar, ten-year infrastructure plan. Therefore, assuming much of Trump's fiscal plans get passed in the first 100 days in office, the back-of-the-envelope estimate for 2017 would be: $616 billion baseline deficit, add $450 billion for tax cuts, at least $50 billion for additional interest and another $100 billion for infrastructure/defense spending. You don't need a master's degree in math to conclude that deficits could increase to well over one trillion dollars rather early in his administration. But that's not all; we have another risk that could add to the deficit. The current business cycle has been the longest economic expansion since WWII. The average expansion is 38 months, and the current one is already 90 months in duration. Therefore, a recession sometime in 2017 is more than overdue. If we did enter an economic contraction next year deficits could explode by an additional $1.2 trillion; just as they did during the Great Recession of 2009. With deficits more than likely north of $1 trillion dollars -- or north of $2 trillion dollars if we enter into a recession -- there could be a massive and record supply of debt issuance that will put enormous upward pressure on yields. Adding to this dynamic is the waning demand for U.S. debt from China. Data from the Treasury shows that China, the largest owner of US government debt, has cut its holdings every month between May and September of this year. And this was before the infamous phone call from Taiwan's Prime Minister to the President Elect and any Twitter war Trump may start with China. In fact, in May alone the Peoples Bank of China sold a net $87 billion dollars in Treasury debt. Therefore, not only is the Fed threatening to resume its tightening cycle come December 24th, but the bond market will have to absorb China's liquidation of its stash of Treasuries as well. In fact, the only condition still preventing the bond market from an immediate implosion is the QE coming from the European Central Bank (ECB) and the Bank of Japan (BOJ). However, the ECB has just indicated that it will reduce its bond purchases starting March 2017. And In Japan, Hakubun Shimomura, a senior member of the ruling Liberal Democratic Party said recently, "If the yen weakens too much, import prices go up. I hope the yen doesn't get much cheaper than its current level." But the bottom line is there's no way the current total of QE coming from the ECB and BOJ can offset the awakening from the 35-year old comma of bond vigilantes. Once they decide the $100 trillion global market is a sell...the game is over. As the ten-year yield approaches 3%, which is more than double the rate seen just five months ago, all forms of fixed income, along with their proxies, will come under extreme pressure. This means; corporate debt, municipal bonds, REITs, CLOs, student and auto loan securities, bond funds, the real estate market, all dollar-denominated foreign debt and equities will fall concurrently along with the global economy. All this should occur while the multi-hundred trillion dollar interest rate derivative market gets blown to smithereens. Simplifying the tax code and reducing regulations are necessary steps in restoring America to greatness. But by no means will Trump's economic plans offset the bursting of an epic bond bubble that was 35 years in the making. Nor will protectionist trade policies and massive deficit spending rectify the economic imbalances manifest from 8 years' worth of artificial credit offered for free. The earnings yield on the S&P 500 is falling just as the yield on the 10-year is rapidly rising. Therefore, equity risk premiums are inexorably dropping towards the flat line. A 3% Ten-year Note yield may be enough to blow the whole economic bubble sky high.